Today I resume the flower posts. I leave you with these beautiful three orange flowers in a row. I would say they are daisies but I am not sure so I leave it up to you to find out. Yesterday's post was a little gross I know and besides I did not realize it was just the day Christians are not suppose to have meat. I am sorry if I hurt any feelings. It was a coincidence and almost a bad joke. I had that post on my mind for a long time and I chose a bad day for publishing. Well, I hope you like my flowers and that they give you peace of mind to enjoy these holidays. 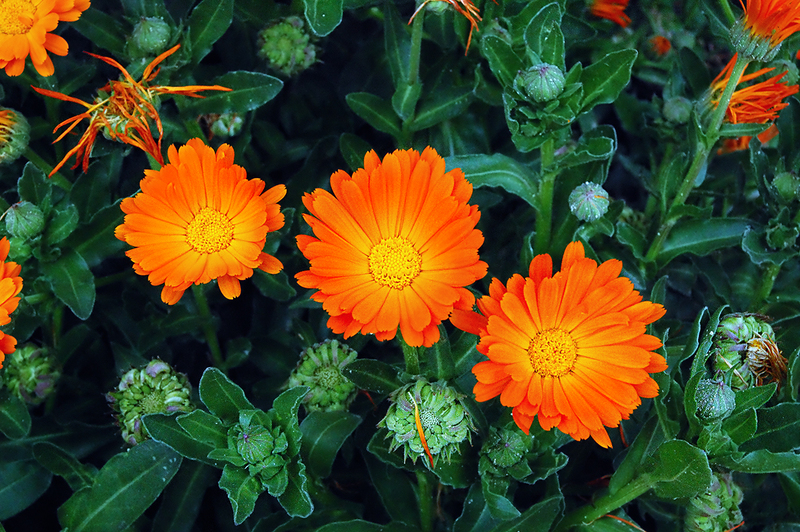 These orange flowers are called Calendula or pot marigold. They have healing properties, and I use them in an all natural ointment I make, or I use them in an herbal tea. Use the petals only. I've seen no uses for the leaves, stems or roots.